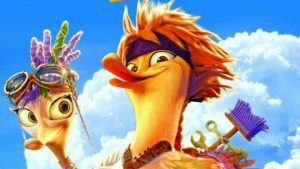 Produced by the Russian animation studio Rome, Quackerz is a comical, animated story about the Chinese legend of the Sun Duck who protects the sun. A conflict flares up between the local Mandarin Ducks and the Military Mallards, who land on the Chinese island, mistaking it for Hawaii. While the fathers fight and argue, Longway, the emperor’s son, and Erica, the commander’s daughter, meet and become friends. The kids must ally all the ducks to battle their foe, the daunting Ms. Knout, who seeks to destroy the Sun. KIDS FIRST! Film Critic Morgan B. comments, “This comical, adventures and fun movie is perfect for the whole family. The story is about Mallard military ducks vs. Mandarin ducks. I like the way it all plays out with all the different story lines, characters and all the jokes.” Brianna B. adds, “The visuals of this film are very clear and captivating with bright colors and depth. The many different outfits and accessories worn by the animals as well as the humans are exciting and fun. These are not your normal hats, gloves, scarves and belts.” See their full reviews below. Do you like crazy ducks, silly henchmen and a love story? Then, Quackers is just ducky for you. This comical, adventures and fun movie is perfect for the whole family. The story is about Mallard military ducks vs. Mandarin ducks. I like the way it all plays out with all the different story lines, characters and all the jokes. The characters in this film are very detailed. They all have different, wonderful voices, which I enjoyed dearly. Robbie Daymond who plays Longway is spectacular. He fits the teenage duck and you can hear the frustration he feels as his desire is to spread his wings and see the world. Andrea Becker who plays Erica is magnificent. She connects with Longway and the two ducks are destined to be together. Enn Reitel who voices Peng Li is hysterical. It is sweet of him to be so protective of his son. Mallard Commander is tough, but he has a soft side and loves his daughter dearly. You can tell that he wants the best for Erica. The story is really about how far fathers will go to protect their children. The voice-over actors are simply amazing and they all have peculiarities that fit their characters and make them sound unique. The animation in this film is amazing. I love that it is so detailed. I like the way they show the town where people live as well as the mountains the ducks call home. All of the cooking scenes with the henchmen have astonishing details. I loved the scene when Longway and Erica are flying and having such a good time. I am also a huge fan of romance. The ducks chewing gum and blowing pink bubbles in the air makes your heart go pitter patter and puts a smile on your face. You can just tell that these two are definitely love birds. The animation in this scene is very detailed. I am a tad bit jealous that she got a gorgeous blue firefly bouquet. It is so amazing. I have a lot in common with Erica and can relate to her. She has girl power which makes her unique and fun. Erica is goodhearted, curious, adorable, smart and a tough cookie when needed. Those are just some of the qualities that I like about this awesome ducky. This movie reminds me of Kung Fu Panda which also takes place in China, has talking animals and features the martial art of Kung Fu. Then, there is Romeo and Juliet’s feathered fathers who keep the star-crossed duckies apart. It also reminded me of Rio because the Mandarin ducks cannot fly. This combination of movies put into one, has a slice of cake for everyone and I love that. I recommend for ages 10 to 18. It is certainly family friendly. So, get a box of crackers and have a family adventure of your own. Be forewarned that there is some violence and the evil Ms. Knout could use a tad more feathers. I give this movie 4.5 out of 5 quacking flapping stars! Brought to you by Shout Factory, it is available on DVD and Digital Platforms July 14, 2016. This animation has bright colors, clear visuals, great music and a story line that I’m sure you will find interesting. 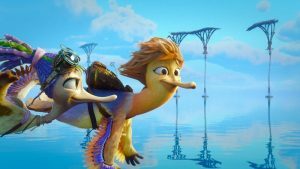 A young Duck Longway (Robbie Daymond-Voice) is completely bored with his uneventful life on an island off the coast of China. His life turns around when a fight breaks out against the Mandarin Ducks and the Military Mallards. Soon after that a war breaks out against the Duck and human race. To top it all off, to keep the Sun in the sky to shine for everyone, one Duck must step up to the challenge. Will he succeed? The visuals of this film are very clear and captivating with bright colors and depth. The many different outfits and accessories worn by the animals as well as the humans are exciting and fun. These are not your normal hats, gloves, scarves and belts. Some of the belts are made of metal and the hats are very different from what you and I are accustomed to seeing. This film, for the most part, accurately displays the feelings and situations that tweens and teenagers feel and go through. I find many different aspects of a few characters to be very relatable. The flow to this film isn’t as smooth as I would like it to be. Also, many of the actions feel as though they are being thrown in haphazardly with no real meaning. The music is upbeat with catchy tunes and it connects you to each scene. One of my favorite scenes is when Longway learns to fly. It represents the freedom of flying and not being tied down to anyone or anything. It’s a great scene that shows individuality and captures what Longway wants from life. I really do not have a favorite character since no single character stands out to me as they are all basically pretty similar. There are a few comedic moments throughout the film, however not a lot. I recommend Quackerz for ages 6 to 12. It’s for both girls and boys and I’m sure they will enjoy the special features including behind the scenes footage. I give this film 3 out of 5 stars. I would have like to see smoother transitions and actions that made sense in the sequences they are played in. Other than that, it’s a good film and I’m sure younger kids will enjoy it. Quackerz is available on DVD and Blu-Ray, so please check it out.